The five self improvement ideas below are 'big picture' personal growth strategies that give you a solid framework for creating positive changes for life. Implement one or all of these life changing ideas and life gets better. Guaranteed! "If you learn only methods, you'll be tied to your methods. But if you learn principles you can devise your own methods." There are all kinds of ideas out there about how to improve or change your life. It can be overwhelming to the point that you may end up reading, but never actually implementing. You're entertained, but your life for the most part remains unchanged. Truly life changing ideas must take you out of the mind. 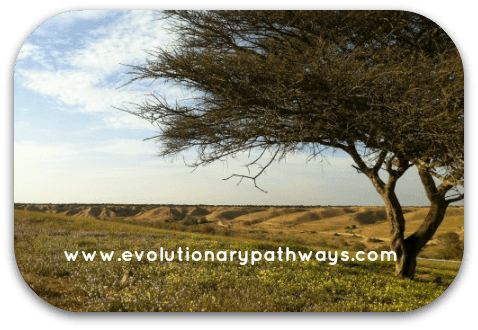 Evolutionary pathways - your very own - to walk and find. Change for life often plays out as a dynamic 'dance' between opposites. Mind and body, thought and action - whatever you do you're bound to get a reaction. Yet, falling to an extreme this dynamic balance may temporarily be lost. Thinking too much, for example, you may become stuck - unable to move. Moving too much, on the other hand, you may be unable to slow down and think. Dynamic, inspired life change happens somewhere in between the two extremes. Same goes for inspiration and realization. Inspiration is an exceedingly positive motivational force for change in your life. Yet, inspiration can also become a crutch - something to hold onto when we're in fact stuck. After all, unhindered inspiration naturally brings you towards realization. Yet, obstacles and mind habits can get in the way. Inspiration is your breath of life. Yet breath alone isn't the point - breath needs a body to animate. The point of breathing is to animate the body. In much the same way, inspiration breathes life into everything you do. Inspired life change actually takes place. Being inspired - whether by a person, an idea, an article or a movie - is great. Inspiration is a wonderful, even intoxicating, state of being. Yet inspiration will fall short of a positive force for change in your life unless it moves you to do things differently this time. That's when inspiration sets you on the road to realization - when changes become real - when they start materializing in your life. Inspiration is the vertical column in Evolutionary Pathways' logo above. Realization is the pathway itself - meant for walking. Honor both inspiration and realization for their own essential parts in your inspired life change equation. Don't let the fear of fear, comparing yourself to others or any other ﻿mind habit﻿ for that matter - get in your way. Moving from inspiration to realization requires a commitment of the body. It requires avoiding these motivation and self improvement pitfalls by continually stepping out of the mind. It's easy to get inspired by self improvement ideas or principles; yet fail to commit the body. You may have set your mind on an inspired life change, for example, only to find yourself mesmerized by the ideal or by a vision of perfection your mind has conjured. Before you know it, you're making absolutely zero progress towards realizing the changes you intend. Perfectionism and procrastination bring everything to a screeching halt; or worse, prevent you from ever beginning. In pursuit of inspired life change don't confuse inspiration with commitment. Remember: Commitment is for the body, while principles are for the mind. When perfectionism and procrastination cause analysis paralysis to set in, remember this self improvement idea: Commitment is for the body and principles are for the mind. It's Einstein who said, "A problem cannot be solved at the same level it was created." With all due respect to Einstein, that doesn't seem to stop us from trying! How many times have you tried to find conventional solutions to an inspired life change that may have been anything but? You may have tried the latest diet, the latest workout craze or 'wonder pill' to get fit and in shape. You may have tried the latest buzz in marketing methods to give that extra push to get your business off the ground. You may have tried following conventional 'wisdom' in dealing with relationships. When what you've tried, fails, you're left wondering why. Have you actually been trying to solve a problem on the same level the problem was created? Are you trying to fight an unconventional inspired life change 'war', restricted by conventional self improvement ideas? Inspired life change is never conventional. After all, it's your own unique body and mind that's involved in the undertaking. What works for one person, may not work for the next. What works for one business, may not work so well for another. Once you have your intention set on the inspired life changes you want, it's time to get creative. Remain open-minded, flexible and willing to adapt and nothing will be able to stop you. Where convention stops - that's where creativity takes off. Your creative subconscious mind is only bound by the limits you place on it. Be intentional, not conventional in pursuit of the life change you want. Don't let conventions - either your own or those of others - prevent you from walking your path and realizing your goals. It's tempting to think that reconnecting with true inner self is sufficient for authenticity to unfold. Yet, just because 'authenticity' or 'being authentic' are the new buzzwords these days, doesn't mean we have to be simplistic about it. Reality is a little more complex. The totality of authentic self consists of three faces of self and mind. Bringing these three aspects of self to operate as an aligned, united whole is what puts you on the sure road to authentic self expression - where synchronicity unfolds. It was the psychiatrist Carl Jung who coined the term 'synchronicity', defining it as "meaningful coincidences" (among other definitions, see Wikipedia definition of synchronicity). The more you travel down the road of authentic self expression, the more 'meaningful coincidences' will seem to come your way. Things become undoubtedly easier with synchronicity operating by your side. Use it to gauge where you're at on your path. How much struggle vs. ease are you experiencing on the road to inspired life change? Do you notice 'meaningful coincidences' quite often on your way? Your answers may indicate whether you're on track with authenticity or perhaps would do well to realign - to bring more of yourself to life. I hope you enjoyed reading these self improvement ideas for changing your life. As with any idea - I hope you capitalize on them and step into the positive life changes in store. As you do, you'll climb an upward spiral of inspiration and realization as you make your way - your evolutionary pathway.